Assistant Professor, International Communication and Media. Deadline: November 30, 2018. Within the Professional Communication Program of the School of Communication, Writing and the Arts. Research interest in international/intercultural media/communication. Assistant Professor, Ethnic Studies Faculty with an Emphasis in Black Studies. Deadline: January 7, 2019. Within the Department of Ethnic and Religious Studies. Ability to teach Black Studies and comparative Ethnic Studies courses effectively at the undergraduate level. Assistant Professor of International, Transnational, and Global Communication at San Francisco State University. Deadline: October 12, 2018. The Communication Studies Department at San Francisco State University offers an exciting opportunity for a tenure-track Assistant Professor position in international, transnational, and global communication beginning August 2019. Preference will be given to candidates whose teaching and research interests include one or more of the following: international and intercultural communication, political economy of transmigration, human rights, indigeneity and intersectionality in a global perspective, refugees, diasporas and displaced persons, and international disputes. We are especially interested in qualified candidates who can contribute, through their research, teaching, and service, through diversity, to the excellence of the academic community. Leeds-Hurwitz, W. (1990). Culture and communication: A review essay. Quarterly Journal of Speech, 76, 85-96. The idea to use fruit for the visual explanation of the different terms was Linda’s, and came from proverbs: in English, one is told not to compare apples and oranges; in many other languages, the fruits referred to are apples and pears. The poster thus implicitly refers to the relativist idea that cultures shouldn’t be judged in comparison to others. As with other series, if you wish to contribute an original contribution, please send an email before starting any work to receive approval, to minimize inadvertent duplication, and to learn about technical requirements. As is the case with other CID Publications, posters should be created initially in English. 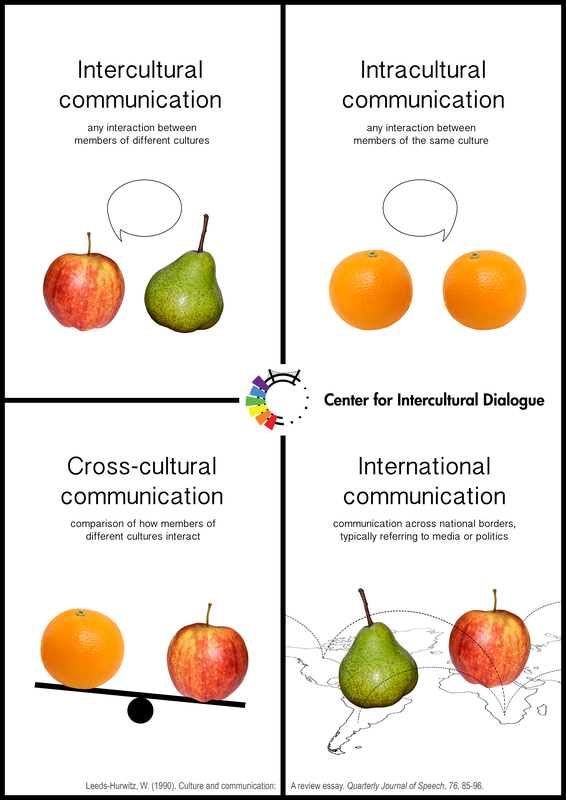 Given that translations of the Key Concepts in Intercultural Dialogue have received so many views, anyone who wishes to translate their own poster into another language (or two) is invited to provide that as well. If you want to volunteer to translate someone else’s poster into a language in which you are fluent, send in a note before starting, to receive approval and to confirm no one else is working on the same one. We are especially interested in candidates who specialize in the following fields: Intercultural Relations and International Communication. Dr. Nilanjana R. Bardhan (Ph.D., Ohio University) is professor and director of graduate studies in the Department of Communication Studies at Southern Illinois University Carbondale (SIUC). Dr. Bardhan’s teaching interests include intercultural/international communication, public relations and critical media and cultural studies. In her research, she particularly focuses on identity/difference/culture, diversity and inclusion, globalization and postcolonial theory. She teaches both graduate and undergraduate courses and has been awarded the Outstanding Faculty Teaching Award in the Communication Studies Department at SIUC twice. She advised the department’s Public Relations Student Society of America (PRSSA) chapter for 10 years, and continues to be involved with the organization. Dr. Bardhan is the co-editor of Public Relations in Global Cultural Contexts (Routledge) and Identity Research and Communication (Lexington Press), and the co-author of Cultivating Cosmopolitanism for Intercultural Communication (Routledge). The latter two books have won best book awards from the National Communication Association’s International and Intercultural Communication Division. She has published several book chapters, and articles in journals such as the Journal of International and Intercultural Communication, Communication Quarterly, Journal of Public Relations Research, Journal of Communication Management, Mass Communication & Society, Communication Education, Public Relations Review, International Journal of Strategic Communication and the Journal of Health Communication. She serves on the editorial boards of the Journal of International and Intercultural Communication, PR Inquiry, and the International Journal of Strategic Communication. Sobré-Denton, M. & Bardhan, N. (2013). Cultivating cosmopolitanism for intercultural communication: Communicating as global citizens. New York: Routledge. Bardhan, N., & Orbe, M. (Eds.). (2012). Identity research and communication: Intercultural reflections and future directions. Lanham, MD: Lexington Books. Bardhan, N. & Weaver, C.K. (Eds). (2011). Public relations in global cultural contexts: Multi-paradigmatic perspectives. New York: Routledge. Bardhan, N., & Zhang, B. (in press). A post/decolonial view of race and identity through the narratives of U.S. international students from the global South. Patwardhan, P., & Bardhan, N. (2014). Worlds apart or a part of the world? Public relations issues and challenges in India. Public Relations Review, 40(3), 408-419. Bardhan, N. (2013). Constructing the meaning of globalization: A framing analysis of The PR Strategist. Journal of Public Relations Research, 25(3). 1-20. Suo, C., & Bardhan, N. (2013). Charting the waters of globalization: An analysis of Haier’s strategic organizational communication. International Journal of Strategic Communication, 7(3). 186-206. Bardhan, N. (2011). Slumdog Millionaire meets ‘India Shining’: (Trans)national narrations of identity in the South Asian diaspora. Journal of International and Intercultural Communication, 4(1), 42-61. Bardhan, N. (2015). Building bridges along the edges of culture. In K. Sorrells & S. Sekimoto (Eds. ), Globalizing Intercultural Communication: A Reader (pp. 55-62). Los Angeles: Sage Publications. Bardhan, N., & Sobre-Denton, M. (2015). Interculturality, cosmopolitanism, and the role of the imagination: A perspective for communicating as global citizens. In M. Rozbicki (Ed. ), Perspectives on interculturality (pp. 131-160). Palgrave Macmillan. Bardhan, N., & Patwardhan, P. (2014). Public relations in a transforming environment: Perspectives from public relations leaders in India. In B. Berger & J. Meng (Eds. ), Public relations leaders as sense makers: A global study of leadership in public relations and communication management (pp. 156-170). New York: Routledge. Bardhan, N. (2012). Culture as a “traveling” variable in transnational public relations: A dialectical approach In D. Waymer (Ed. ), Culture, social class and race and in public relations (pp. 13-30). Lanham, MD: Lexington Books. California State University, Sacramento, seeks applications for a specialist in Intercultural Communication for a tenure-track appointment as an assistant professor to start in the Fall 2017 semester. Education: Ph.D. in Communication Studies. ABD candidates will be considered. ABD candidates will be required to complete the doctorate by August 2017. Required Knowledge & Abilities: Evidence of excellence in teaching at the university level. Teach introductory, advanced, and graduate level courses. Interest in and the ability to conduct scholarly research. A demonstrated ability to work with a diverse population. Preference given to those with teaching and research background in quantitative methods. Experience: Prior teaching experience at the college or university level and with students from diverse groups. 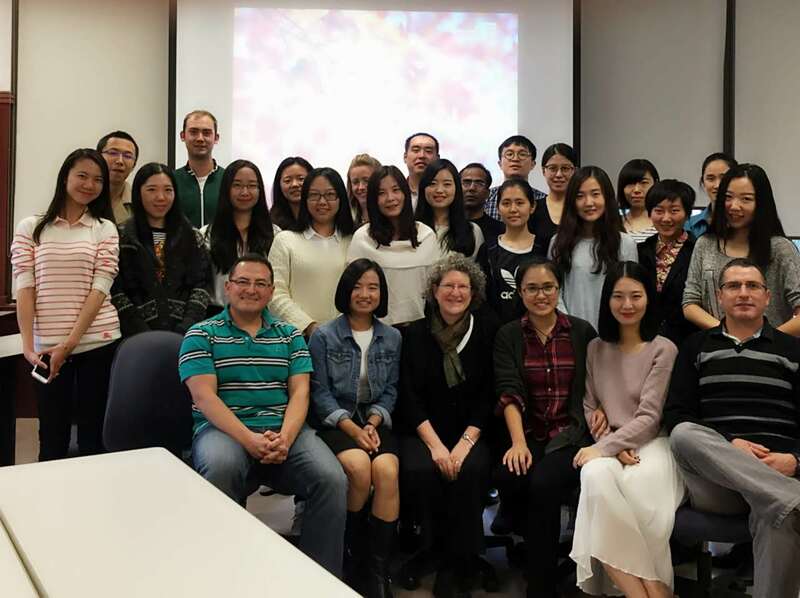 Teaching/research in developing areas of intercultural/international communication such as globalization, cross-cultural communication, health communication and/or co-cultural dimensions of diverse societies. students; engage in scholarly activities; and provide service to the department, campus, and community. * Candidates must include the application materials as a single PDF. Awards will be presented at the International and Intercultural Communication Division Business Meeting in Las Vegas at the 2015 NCA Convention. Recipients of the awards will be notified by September 1, 2015 and are expected to be present for the award presentations. Self, peer, or advisor nominations are welcomed. The awards committee will not accept more than one submission of the same co-/author, whether they are nominated or self-nominated, regardless of category. Works must have been copyrighted during the 2014 calendar year. Nomination packets must be received by April 25, 2015. The School of Communications at Webster University invites applications for a tenure track Assistant Professor position in International Communication and Media Studies, in our Communications & Journalism Department. We are seeking a teacher-scholar with the experience and creativity to help us build curriculum in international and comparative communication, media, and culture. Other areas of interest could include intercultural communication, political communication, communication and development, or other areas of the candidate’s expertise. The successful candidate will teach in Media Communications or other programs in the Department, including advertising, public relations, or journalism, as well as advising students, and engaging in faculty service and professional development, including scholarship and creative activity. The School of Communications at Webster University prepares students to excel as skilled professionals in the global field of communications. We provide theory and practice in media courses framed within a liberal arts-based curriculum, augmented by personalized mentorship, and professional development opportunities. Fifteen distinct majors are available at the undergraduate level and master’s degrees in five diverse fields of communications. We offer BA and MA programs on the Webster campuses in Geneva, Vienna, London, Leiden, Thailand, and Ghana, as well as in Saint Louis and online. Webster University, founded in 1915 with its home campus in Saint Louis, Missouri, USA, is the only Tier 1, private, nonprofit university with campus locations around the world including metropolitan, military, online and corporate, as well as American-style traditional campuses in North America, Africa, Europe, and Asia. Webster University is an Equal Opportunity/Affirmative Action educator and employer. We are committed to maintaining a culturally and academically diverse faculty of the highest caliber. We strongly encourage applications from those who identify as diverse in terms of gender, race, ethnicity and/or sexual orientation. MINIMUM QUALIFICATIONS: Ph.D. in Communication in hand by August, 2015. A scholar who works at the intersection of communication and culture at the global level from a qualitative, critical, interpretative, textual or rhetorical perspective. Applicants must possess an active research program in the area of communication and culture globally as well as demonstrated teaching effectiveness at the undergraduate level. PREFERRED QUALIFICATIONS: The successful candidate will have research expertise in international or transnational communication at the macro level in order to broaden students’ perspectives about the ways that global issues influence the study of communication. Candidate has experience teaching intercultural communication. Areas of preferred emphasis include one or more of the following: human rights, global movements, international labor issues, postcolonialism, international relations, cultural inflections of citizenship and public culture, NGOs, terrorist studies, sovereignty, critical whiteness studies, international disputes, and/or globalization. Demonstrated intercultural commitment and experience with diverse groups in teaching, research and/or service is preferred. • Engage with the community through department, college, university, discipline, and community service. APPLICATION: Review of applications will commence December 1, 2014. Position open until filled. All applications must include a completed Faculty Application; cover letter; a one-page explanation in which applicants address their demonstrated intercultural experience and commitment to diversity and equity in teaching, research and/or service; curriculum vitae; statements of teaching philosophy and research interests that address both the minimum and preferred qualifications; a maximum of three reprints of representative scholarly activities; copies of all transcripts that include relevant course work; and two representative samples of teaching evaluations that speak to the applicant’s qualifications and abilities. In addition, three current letters of recommendation must be provided by the deadline. Must be able to communicate effectively and work cooperatively with departmental colleagues to support the Department’s mission. The department consists of 11 tenure track faculty and sixteen lecturers who offer two undergraduate degree programs (i.e., one in Communication and another in Mass Media), and two minors (i.e., Communication and Critical Intercultural Communication) to slightly over 800 students, in addition to multiple sections of Oral Communication (GEO 102) that serve the entire university. The university is particularly interested in hiring candidates who have experience working with students from diverse backgrounds and who demonstrate a commitment to improving access to higher education for under-represented groups. California State University San Marcos is an Affirmative Action/Equal Opportunity Employer strongly committed to equity and diversity and seeks a broad spectrum of candidates in terms of race, sexual orientation and identity, gender, age, and disability or veteran status. CSUSM has been designated as a Hispanic Serving Institution (HSI) and an Asian American Native American Pacific Islander Serving Institution (AANAPISI) and was recently named one of the top 32 Colleges “most friendly” to junior faculty by the Collaborative on Academic Careers in Higher Education. An offer of employment may be contingent upon successful completion of a background check. Should the results of a background check not be successful, any offer will be withdrawn and/or employment terminated. Falsification of information may also be cause for termination of employment, corrective action, or rejection.